Platform: about cm. Heel Height: about cm. Notice ： actual color may differ from your computer display. No chating,only fair trading.Trust us ! and you will get more. We will do our best for you! Platform: about 1 cm. Heel Height: about 121cm. Due to the difference between different monitors, the picture may not reflect the actual color of the item. No cheating,only fair trading.Trust us ! 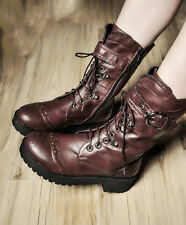 Stunning faux leather mid calf biker style boots. Enhanced with a quilted effect detail. These are fabulous, eye-catching boots. With a contemporary style look. Good gripping durable sole.